Cloudera Navigator metadata features provides data discovery and data lineage functions. The Cloudera Navigator metadata architecture is illustrated below. The Navigator Metadata database stores entity metadata, policies, and user authorization and audit report metadata. The Cloudera Navigator Metadata Server manages metadata about the entities in a CDH cluster and relations between the entities. The metadata schema defines the types of metadata that are available for each entity type it supports. technical metadata - metadata defined when entities are extracted. You cannot modify technical metadata. custom metadata - metadata added to extracted entities. You can add and modify custom metadata before or after entities are extracted. HDFS - Extracts HDFS metadata at the next scheduled extraction run after an HDFS checkpoint. However, if you have high availability enabled, metadata is extracted as soon as it is written to the JournalNodes. Hive - Extracts database and table metadata from the Hive Metastore Server. 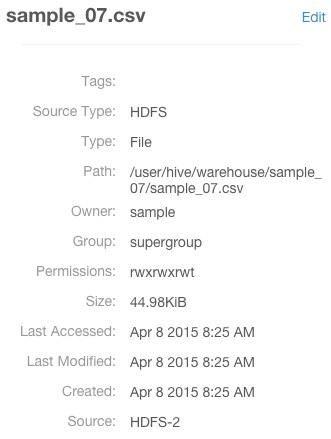 See Enabling Hive Metadata Extraction in a Secure Cluster. Impala - Extracts database and table metadata from the Hive Metastore Server. Extracts query metadata from the Impala Daemon lineage logs. MapReduce - Extracts job metadata from the JobTracker. The default setting in Cloudera Manager retains a maximum of five jobs, which means if you run more than five jobs between Navigator extractions, the Navigator Metadata Server would extract the five most recent jobs. Oozie - Extracts Oozie workflows from the Oozie Server. Pig - Extracts Pig script runs from the JobTracker or Job History Server. Spark - Extracts Spark job metadata from the YARN logs. Unsupported and disabled by default. To enable, see Enabling Spark Metadata Extraction. Sqoop 1 - Extracts database and table metadata from the Hive Metastore Server. Extracts job runs from the JobTracker or Job History Server. YARN - Extracts job metadata from the ResourceManager. After metadata is extracted it is indexed and made available for searching by an embedded Solr engine. The Solr schema indexes two types of metadata: entity properties and relationship between entities. You can search entity metadata using the Navigator UI. Relationship metadata is implicitly visible in lineage diagrams and explicitly available in a lineage file.